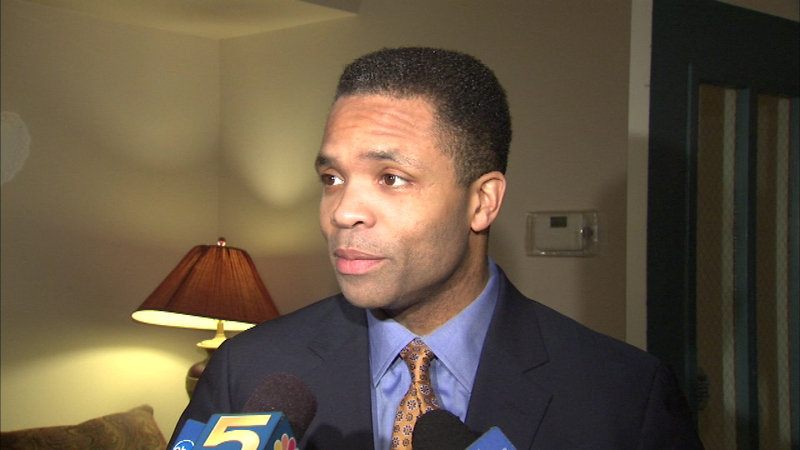 Former Congressman Jesse Jackson Jr.
CHICAGO (WLS) -- Former Congressman Jesse Jackson Junior will no longer seek to get his divorce case heard in Cook County court. On Wednesday, his attorneys announced the case will proceed in Washington D.C. in the best interest to the family. Jackson and his estranged wife, Former Alderman Sandi Jackson, had been battling over where the divorce case should be heard. "This case is and always has been about the protection of my children from damaging information and material not in my possession. It remains the desire of the entire Jackson Family that none of its members, particularly the young children, be subjected to the very damaging emotional and psychological harm that could flow from the introduction of these materials into the public sphere by third parties. While I am dismissing my formal legal action in Chicago and choosing to pursue my case in Washington, my family's resolve in this regard is not diminished." Court documents show that Sandi Jackson has asked for details of any sexual partners her husband had during their marriage. He has responded saying that information is irrelevant. Jesse Jackson Jr.'s attorney, Brendan Hammer, said the former congressman submitted the motion Wednesday morning because attorney fees were getting too expensive. His attorneys will be in court on Friday at the Daley Center. They expect the judge to dismiss the case and move it to Washington D.C. There will also be a court hearing in D.C. on Friday where they will begin discussing spousal support. His attorney said he has already agreed to pay more than $1,500 in child support.